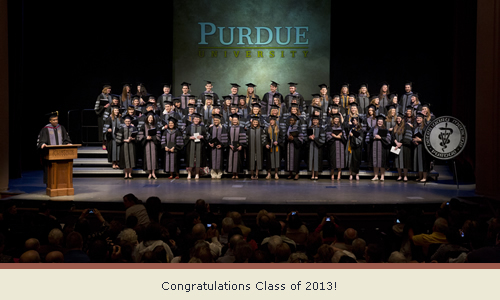 The DVM Class of 2013 became the Purdue University College of Veterinary Medicine’s 50th graduating class during commencement ceremonies Sunday, May 12. The proceedings included the traditional oath ceremony, which was held in Loeb Playhouse in Stewart Center immediately following the University commencement ceremony in the Elliott Hall of Music. 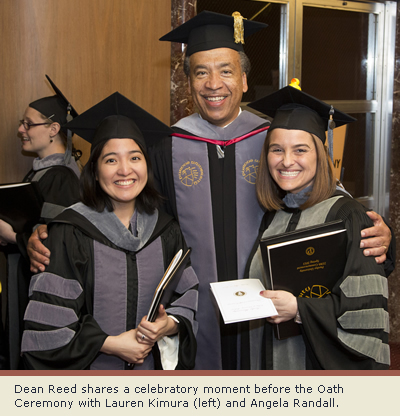 Dean Willie Reed emphasized the significance of the graduates’ place in history as members of the 50th class to graduate since the College’s first commencement ceremony in 1963. He also commended the class for being active participants in the life of the Purdue University College of Veterinary Medicine, and in particular, praised them for their role in hosting the very successful 2012 SAVMA Symposium. The president of the Indiana Veterinary Medical Association, Dr. Phil Borst (PU DVM ’75) and the secretary/treasurer of the Purdue Veterinary Alumni Association, Dr. Jerry Rodenbarger (PU DVM ’79), also were on hand to congratulate the graduates and share insights and words of wisdom. Then, Josh Taylor gave the class response before Dean Reed administered the Veterinarian’s Oath, which was recited by all veterinarians in the audience as well as the new graduates. At a reception following the ceremony, the graduates received a commemorative desk name plate from the PVAA.